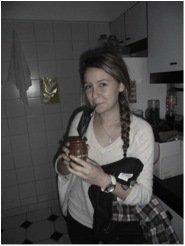 Ania is an InterExchange Working Abroad Ambassador in the Volunteer in Argentina program. Here are some interesting reoccurring events that I have seen/learned/experienced in my time in BA. You don't need more than three weeks to whiteness these interesting things about this city yourself. 1. You know you've stepped foot in Buenos Aires when you are casually walking on the street and feel something soft and mushy under your sneaker. Yes, it's dog poop and it's everywhere. So even though you might want to keep your eye on a map to know where you are, it is a good idea to look down. Don't worry, eventually you will become a pro at avoiding it. The vast amount of it on the side walk is not surprising since I walk by about 5 dog walkers everyday on my way to school. Looks like Portenos love to have furry companions! One other thing is the pets here are very tame and will only be on leashes if someone has more than one pet. In fact, one day I was walking back from school and was trying to change a song on my iPod when all of a sudden I almost stepped on a cat. A CAT? 2. So even though you are looking very attentively at the ground to stay away from anything brown, you need to look up because drivers in BA are known for their sharp turns. Just like my host mom said- Portenos find that following the traffic signals is optional. I cannot count the amount of times I saw two cars hit on the street corner, only to stop for a second, and continue driving. Some goes with pedestrians, they get hit (touched) by cars all the time, only to continue with their day. 3. It surprised me a little to learn that it is VERY typical for Portenos to visit a psychologist regularly. Don't be surprised if they find it a little strange that you don't. Psychoanalysis is HUGE here, so don't express too much negativity about Freud. While walking around the street I have seen many flyers advertising psychology services. Additionally, my Spanish teachers have used some of their visits as examples in our grammar exercise. When I found out that most of the healthcare available in Argentina includes free visits to the psychologist I was not as surprised. Portenos value mental health and clarity. I am all for bringing this kind of attitude back to the US. 4. If you are as unlucky as I am, you will get sick during your time here. 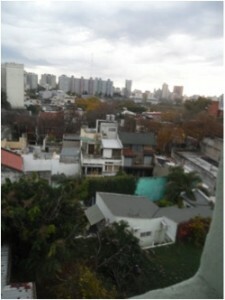 It is wintertime in Buenos Aires right now, and although the temperature does not turn as drastically cold as it does in Chicago (where I am from) it is still cold. Most houses do not have central heating here so while having a high fever I formed a special relationship with my heater. I really did not want to leave my room since the rest of the house seemed cold. Do not underestimate BA winter, bring heavy sweaters and long socks. You will thank yourself when the time comes. 5. The Subte (subway system) is a very interesting place. Everyone will tell you to hold on to your purses/personal items. That is why it has become very fashionable to wear your backpack on your stomach when on the subway. Do not go hipster on this; do as they do. Aside from being protective of your belongings, the public transportation system here is superb. 6. Enjoying night life is one of the essential things to do when visiting a new area. But be prepared, people live late here. Dinner is usually after 9pm and when going out 3am + is when the actual parties start. 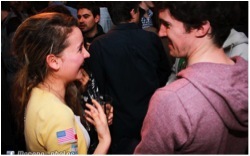 SOME ADVICE when going out: When asked where you are from continue to talk to them in Spanish… or else they will most likely use the opportunity to practice their English. Trust me, even if you are using broken Spanish with them, they are most likely to be very polite and compliment you. 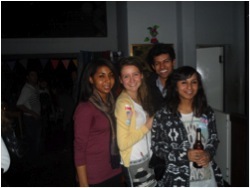 I went to a great event called MUNDOLINGUO where a group of people meet at a bar and practice languages together. Everyones identified by flag stickers! It's fun, and people are pretty serious about not breaking into their native tongue. There are other events called Spanglish that have more rigid rules but are also a great way to practice and meet people from all over. 7. And although your first couple of days may have included some accidental poop stepping, language mistakes, and exhausting mornings, you know you have become accustomed to the Porteno lifestyle when you can look back on your day and laugh about it while sipping on some warm mate (be warned: the taste of the tea must be acquired). My Spanish classes are running smoothly so far, and I am excited to share with you my experience with AMAUTA soon.